I started my part-time D.Phil in 1996 with Ben du Boulay as my supervisor working on something that was a combination of information retrieval and natural language processing. For various reasons—health, job, personal reasons, etc—I intermitted a lot. As my last intermission period was expiring, I put a great deal of thought into whether I wanted to continue or not. I was loathe to completely give up everything, so I decided to continue doing a Ph.D. but unite my three lifelong interests into something more related to what I actually do: educational technology. I therefore started a new D.Phil with Dr. Judith Good in October of 2009 within my original period of registration. What do I hope to discover? How is the “Robert and Susan” metaphor applicable to World of Warcraft and what does that gain us in understanding how to successfully encourage lifelong learning and build communities of learning? How does the social structure in-game and out of game resemble a community of practice? How much of a role does social knowing play in the development of expertise and the dissemination of learning? What features would it be useful to adopt when designing learning communities? What encourages game players to persist in learning and working, although many tasks are boring and repetitive, and to continue improving long past their current goal? How does this relate to Hagel and Brown’s (2009) “lessons”? Hello, my name is Susan. I am bright and highly motivated. I love to learn and to think about things. Robert is taking endless lecture notes until he gets his degree. Robert is very different than me. So this… produces a rather odd kind of student — one who appears polite and dutiful but who cares little about the course work, the larger questions it raises, or the value of living an examined life. And it produces such students in overwhelming abundance. There is an important difference between learning which is concerned with the degree of understanding necessary to practice a skill, and learning which is expressly focused upon an enterprise of understanding and explaining. What you learn isn’t prefiltered and approved, sitting on a shelf, waiting to be consumed… Now we can see for ourselves that knowledge isn’t in our heads: It is between us. It emerges from public and social thought and it stays there, because social knowing, like the global conversations that give rise to it, is never finished. 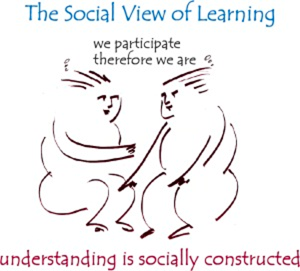 Lifelong learning, like Weinberger’s social knowing, is never finished. It continues on outside the four walls of the classroom. It is on Twitter. It is on Facebook. It is in the student’s workplace. It is in the student’s home. It arises in conversations with the student’s friends and it arises in play. The social component, previously undervalued, is key. Brown describes some research by Richard J. Light where Light discovered that the ability of students to form study groups was one of the strongest determinants of students’ success; it was more important than the instructors’ teaching styles (Light (2001) cited in Brown and Adler, 2008). Brown says this shifts our attention from the subject content to the learning activities and human interactions around them, which, while agreeing with Biggs, goes further by suggesting the instructor themselves is of lesser importance. Susan and Robert, becoming social, taking turns being teachers and learners together, is a powerful combination for deep learning. World of Warcraft (WoW), a massively multiple online role playing game (MMORPG) in the dungeons and dragons genre, is the most successful personal computer game ever released. As of 2008, it had more than 10 million active subscribers worldwide, amounting to 62.2% of the online gaming market (Yee, 2005). Although it is a game, WoW, its communities, and its cultural artefacts share a number of commonalities with lifelong learning in online higher education. The first is that both have Roberts and Susans. The second is that both have structures that support ad-hoc groups where alliances shift, merge, and collapse dynamically as people come and go. The third is that both encourage the formation of communities of practice through their design and purposes (Wenger, 1999). Finally, they both, with varying degrees of success, encourage learning and collaboration that results in an ongoing learning journey continuing past the current goal. These lessons are just as applicable in fostering collaborative learning in online education and lifelong learning as in business, perhaps even more so. My mission is to discover how it applies. Making connections, forging links, firing neurons. It was a fairly busy period. I attended a number of seminars, workshops and conferences, either in person or virtually (see Table 1). Some presentations were previously recorded. The Google Generation – Ian Rowlands – Recorded lecture from May 2008. The Open Learn Conference: Keynote – John Seely Brown – Recorded lecture from October 2007. List of conferences, seminars, and workshops attended virtually or in-person. Although I have been teaching computing science and technology in higher education for over 14 years, I do not have a background or formal training in education. I decided to alleviate that in September by registering for H812: The Postgraduate Certificate in Academic Practice at The Open University, a 60-point course in their online distance education masters program. Upon completion, I will have my Higher Education Academy accreditation for teaching in HE. Prior to that point, I had already agreed to teach H810: Accessibility Online Learning: Supporting Disabled Students, another course in the online distance education program. It was, in fact, applying for a teaching post for this course that led me to decide to rekindle my Ph.D. by changing to something I already do: educational technology. Teaching a pilot course is always a lot of work, especially one where you have a background in half the content—technology—but not necessarily in the other half—educational pedagogy. I spent quite a lot of time in the fall working through the course on my own, just ahead of my students. I have also been dipping into the material for another brand new course: H800: Technology-Enhanced Learning: Practices and Debates, a new course that just started this year, co-authored by Gráinne Conole. What all these courses have in common is exposure to different ideas in educational technology and pedagogy. From the accessibility and e-learning course, I picked up ideas about Wenger’s communities of practice, which I have incorporated into my thinking. From H800, I have been exploring ideas about digital natives and “the Google Generation”. From H809: Practice-Based Research in Educational Technology, I’ve acquired some guided readings on ethnography as a research method, which I suspect is one of the types of study I need to use for studying behaviour within World of Warcraft. It is the course I am actually taking that has proven the most useful, though, as it has a guided introduction to many pedagogical theories, especially constructive alignment from Biggs & Tang (Brown & Adler, 2008). That material was directly usable in the book chapter proposal I submitted earlier this year, the bulk of which is now incorporated into this document. For the second assignment, I did some analysis on a course I chair, examining how outcomes-based learning and teaching, a kind of constructive alignment, has not been properly employed in the course design and how that has resulted in students failing to persist and pass the course. That piece of research served as the basis for my recent “Making Connections” conference presentation. That assignment also included ideas about Robert and Susan and the increase in the number of Roberts, as well as the current nature and purpose of universities. Building on that analysis and inspired by Constance Steinkuehler’s work on scientific literacy practices in World of Warcraft communities, I developed an activity intended to improve academic literacy practices in my Open Source third-year students, and then evaluated the effect on demonstrated practices in their course practices; I presented some of those findings during my “Making Connections” talk, The Nutcracker Effect. That Open Source course I chaired this year has fed into my thinking in other ways too as a direct result of my ongoing fascination with the ideas of John Seely Brown. In a keynote speech I watched, he was comparing evaluating the influence of “tinkering” on Open Source and how that ties into learning. One of my students innocently made a comment about how Open Source is very similar to learning too. It got me thinking about how tinkering is directly applicable to problem-based learning as well as deep learning, both topics related to activities I see taking place in World of Warcraft and ones I want to encourage in communities of practice for learning. I do not spend time looking for relevant course materials. In actuality, useful material from other courses came to my attention because of people in my online personal learning networks with whom I interact via Twitter and Plurk primarily. That includes people like Gráinne Conole (OU), Martin Weller (OU), George Siemens (Manitoba), Bryan Alexander (NITLE), Howard Rheingold (Stanford), Steve Wheeler (Plymouth), Tony Hirst (OU), and Alan Cann (Leicester). I am also connected and in regular contact with a number of other Ph.D. students and researchers around the world, both in e-learning and games research. Not all of the seminars and workshops I attended were immediately obviously applicable, although people I have met at them have fed into my work, like K. Faith’s Lawrence’s and her Ph.D. work on fan fiction and artifact production in LiveJournal communities (2008); or practices that encourage motivation and persistence from an Open University staff workshop. Ben du Boulay’s motivation reading group was also very helpful by picking out important theory papers from psychology and cognitive science in motivation, a topic I did not initially realize was of interest until I started regularly attending those meetings. Now motivation is a key element of what I want to investigate. Rejected but served as the basis for this document and thesis proposal; thesis topic. Ideas, people, resources, discussion, and community. There’s much left to explore. My immediate plan is to complete a literature review and formal thesis proposal by the end of October. That means a summer spent reading. I have some good starting points, both in e-learning, motivation, and game-related to learning areas, including Constance Steinkuehler’s World of Warcraft literacy research and Bonnie Nardi’s work. There is also more to read on John Seely Brown’s ideas on information spaces, learning, and tinkering. I feel I am in a good position to start and make good progress on that without getting too lost. I also can draw upon the advice and recommendations of others in my personal learning network, if need be. I am anticipating at least three studies to complete my Ph.D. work. The first is a beta study to test out the research and data methodology for a larger-scale study in World of Warcraft. At this point, it is not clear whether the study will be an ethnographic study occurring in World of Warcraft directly or some other kind of research, like discourse analysis, on related artifacts like forums and web sites. That will be more evident after the thesis proposal has been written and I have a clearer idea of what specific questions I want the study to answer, perhaps after consultation with Dr. Ruth Woodfield from Sociology. However, I do know that I am looking for metaphors and systems for motivation and persistence that can be transported into an e-learning communities of practice environment. The second study would be the actual large-scale study intended to gather sufficient data to answer the posed questions. The third study would take the hypothesis of motivation and persistence gained from the World of Warcraft studies and apply it to a subject online student population for positive improvements. I hope to facilitate something through my current connections at the Open University. This would be a good route as the student population in my undergraduate courses are quite large and could be divided into control and experimental groups. If an OU group is not possible, using a smaller group from Dr. Good’s online e-learning cohort might work. I am in the process of sounding out various people already at the Open University as to how I would go about obtaining permission to do that. I am also actively looking for small JISC grant projects in related areas that I can apply for on my own. Dr. Tony Hirst (OU) has apparently figured out a way by which universities can be bypassed when applying for JISC funds, thus avoiding the universities annexing up to half for fixed costs out of an already small amount. He has already done this with one of his own projects (Winn, 2009), but I will admit he is in a better position than I am to pull it off. Still, it does not hurt to look and to try. In addition to obtaining funding, another benefit of research grants is that they expect output, usually in the form of published papers or other documents. That would tie nicely into my plans to do a thesis comprised of a collection of papers (published or unpublished) as already permitted in Psychology at Sussex. With my attention deficit disorder, I feel this approach will be a lot easier for me to manage, as individual papers are self-contained and smaller units. My plan is to publish several papers. The initial research questions I have already could form at least one and the two major studies another two. The argument would be that published papers have already undergone some sort of peer review and, by publication, obtained far wider public exposure than most Ph.D. theses ever get. Dr. Good and Dr. Whitby are responsible for making this possible (or attempting to do so) on the departmental side. I would like to see the option available to everyone, but I am confident I should be able to get it as a reasonable accommodation for my disability. My intention is to complete by spring of 2011. I will include a tentative timeline of things to be done and when in my thesis proposal at the end of October. In order to complete in 2011, I will need to make a change to my registration status as I am officially out of time in January 2010. I spoke to the postgraduate advisor at the beginning of the year. She believed the department would work with me to either restart my registration period or extend my current one. I am in the process of trying to get that sorted prior to the decommissioning of the school later this summer. Biggs, J. & Tang, C. (2007) Teaching for Quality Learning at University, 3rd edition, Maidenhead, UK, Open University Press. Blandeburgo, B. (2009)> ‘Activision “WoWs,” But Where’s Wireless?’, The Game Trade Journal, blog entry posted March 4, 2009. Available from: http://www.gametradejournal.com/2009/03/activision-wows-but-wheres-wireless.html (Accessed March 9, 2009). Brown, J.S. & Adler, R.P. (2008) ‘Minds on Fire: Open Education, the Long Tail, and Learning 2.0’ Educause Review, 43 (1), [online] Available from: http://connect.educause.edu/Library/EDUCAUSE+Review/MindsonFireOpenEducationt/45823 (Accessed August 22, 2008). Churches, A. (2008) Bloom’s Digital Taxonomy, [online] PDF. Available from: http://edorigami.wikispaces.com/Bloom’s%20Digital%20Taxonomy (Accessed January 20, 2009). Clydesdale, T. (2009) ‘Wake Up and Smell the New Epistemology’, Chronicle of Higher Education, January 23, 2009, [online]. Available from: http://chronicle.com/free/v55/i20/20b00701.htm (Accessed January 23, 2009). Fish, S. (2009) ‘Think Again’, The New York Times, blog entry posted January 18, 2009. Available from: http://fish.blogs.nytimes.com/2009/01/18/the-last-professor/ (Accessed January 22, 2009). Hagel, J. & Seely, J.S. (2009) ‘How World of Warcraft Promotes Innovation’ Business Week Online, January 14 [online] Available from: http://www.businessweek.com/innovate/content/jan2009/id20090114_362962.htm (Accessed January 19, 2009). Krathwohl, D.R. (2002) ‘A Revision of Bloom’s Taxonomy: An Overview’ Theory into Practice, 41 (4), [online] Available from: http://www.informaworld.com/smpp/content~db=all?content=10.1207/s15430421tip4104_2 (Accessed January 12, 2009). Lawrence, K.F. (2008) The Web of Community Trust – Amateur Fiction Online: A Case Study in Community Focused Design for the Semantic Web. Ph.D. thesis, University of Southampton. Weinberger, D. (2007) Everything Is Miscellaneous: The Power of the New Digital Disorder, New York, USA, Holt Paperbacks. Wenger, E. (1999) Communities of Practice: Learning, Meaning, and Identity, Cambridge, UK, Cambridge University Press. Wesch, M. (2008) ‘A Vision of Students Today (& What Teachers Must Do)’, Britannica.com, blog entry posted October 21, 2008. Available from: http://www.britannica.com/blogs/2008/10/a-vision-of-students-today-what-teachers-must-do/ (Accessed October 21, 2008). Winn, J. (2009) ‘JISCPress: Developing a Community Platform for the JISC Funding Process’, The Learning Lab, blog entry posted June 5, 2009. Available from: http://joss.blogs.lincoln.ac.uk/2009/06/05/jiscpress-developing-a-community-platform-for-the-jisc-funding-process/ (Accessed June 5, 2009). Woodcock, B.S. (2008a) MMOGCHART.Com, [online]. Available from: http://www.mmogchart.com/ (Accessed March 8, 2009). Woodcock, B.S. (2008b) An Analysis of MMOG Subscription Growth: Version 23.0, [online]. Available from: http://www.mmogchart.com/analysis-and-conclusions/ (Accessed March 8, 2009). Yee, N. (2004) Player Demographics, [online] The Daedalus Project. Available from: http://www.nickyee.com/daedalus/gateway_demographics.html (Accessed March 9, 2009). Yee, N. (2005) ‘WoW Basic Demographics’, The Daedalus Project, blog entry posted July 28, 2005. Available from: http://www.nickyee.com/daedalus/archives/001365.php (Accessed March 9, 2009).